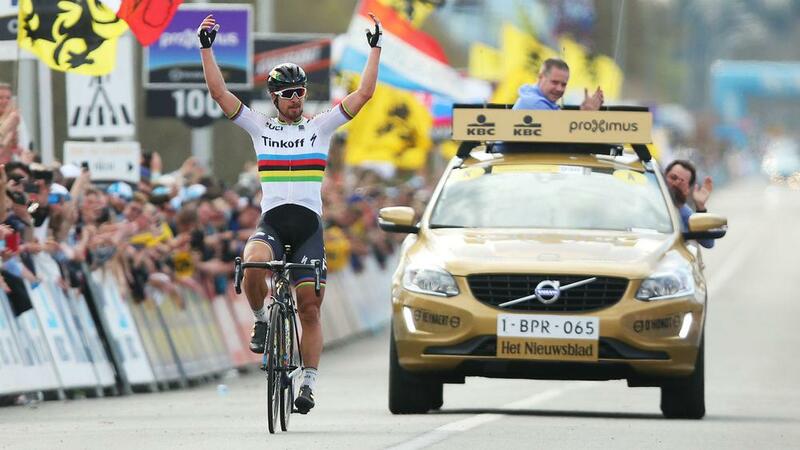 World champion Peter Sagan claimed his second title in a week after storming clear to end his wait for a monument victory at the Tour of Flanders and deny Fabian Cancellara a record-breaking triumph. Sagan won the Gent-Wevelgem last Sunday and was in a class of his own once again seven days later as he was crowned champion on the cobbles in the 100th edition of the prestigious Tour of Flanders. The 26-year-old Slovakian suffered a blow on the eve of the race when Tinkoff team-mate Maciej Bodnar was hospitalised after a crash in training, but he was not to be denied an impressive victory in a one-day Classic for the first time. Greg Van Avermaet's hopes of victory on home soil were ended as a result of a crash which left him nursing a suspected broken collarbone less than 100km into the 225km race from Bruges to Oudenaarde. Another big pile-up at the 129km mark left a host of riders on the deck and it proved to be Sagan's day once again, as he dropped Sep Vanmarcke (LottoNL-Jumbo) on the final climb of the Paterberg and burst away in the rainbow jersey before pulling a wheelie after crossing the line. Cancellara was hoping to become the first man to win the race four times, but the Trek-Segafredo rider finished 25 seconds behind Sagan in second place ahead of Belgian Vanmarcke. It was Cancellara's last shot at a historic fourth Tour of Flanders title as he retires this year, while the 2015 winner Alexander Kristoff had to settle for fourth spot. Sagan was the second world champion to top the Tour of Flanders podium in Oudenaarde on Sunday after Lizzie Armitstead won the women's race and he will aim for another success in the Paris-Roubaix next weekend.